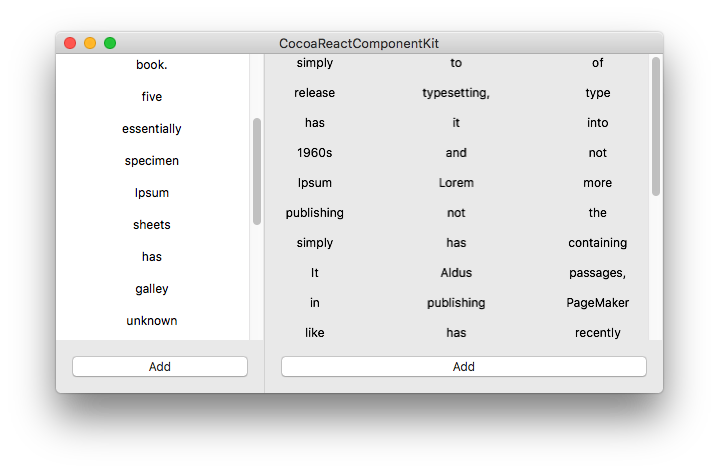 CocoaReactComponentKit is ReactComponentKit for Cocoa, Mac OS X. CocoaReactComponentKit is a library for building NSViewControllers. You can make NSViewControllers based on Components. Also, It uses MVVM and Redux architectures for unidirectional data flow. (2) : ViewModel passes the actions to the store. You can use beforeDispatch(action:) method to do some work before dispatching actions. (3) : Store passed current state to the Redux pipeline. Middlewares, Reducers and Postwares make a new state. (4) : New State comes out from the Redux pipeline. It is passed to the store. (5) : Store passes the new state to the ViewModel. (6) : ViewModel passes or propagates the state to the Components. CocoaReactComponentKit provides four components basically. It is a basic component for making a scene. It is just a NSView that has some convenient methods for dispatching actions and receiving states. It is a component for making a scene that uses NSCollectionView. It is a component for making a scene that uses NSTableView which has only one column. It is a component for spliting a massive view controller.